"Sometimes I sit down on a big flat rock, which abuts a garden pool, and listen to the drip-drip of the water as it falls with quiet measured cadence into the pool. I think of the great back-to-nature movement, which has, under the name of Taoism, for so many centuries fascinated and motivated the classic Chinese lifestyle. And I think that 'fishing' in nature for serenity is no monopoly of the Chinese, nor indeed of any century, and that it is my prerogative, as well, to be a 'fisherman.'" So says Mary Mayer Tanenbaum in one of the many outstanding articles she wrote on the relationship among Chinese art, nature, and philosophy. Between 1974 and 1985 she contributed over sixty of them to the Christian Science Monitor, some forty-five of which are included in Fishing on the Terrace. 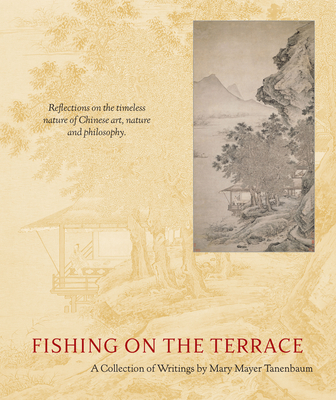 Tanenbaum's ability to fuse her twentieth-century perceptions of nature seamlessly with the nature invoked by Chinese landscape paintings encourages the reader of the articles to become a "fisherman" as well. Her writing's powerful ideas can easily overtake a quiet afternoon spent in the mountains or even a morning meditation in one's own garden. The distinct wisdom that Tanenbaum imparts in each of her reflections is accentuated here by the accompanying illustrations. Alongside the articles, one will find beautiful color reproductions of the Chinese paintings and objects that inspired them. Today more than ever--with our twenty-first-century predisposition toward environmentalism, Eastern thought, and a return to nature--Tanenbaum's writings echo with the clear tone of inescapable truths. They are available for the first time as a collection, to be enjoyed for years to come. Mary Mayer Tanenbaum was born and raised in San Francisco, where her girlhood experience of the sights and sounds of Chinatown sparked a lifelong passion for Chinese culture. After graduating from Stanford in 1936, she worked as a book reviewer for the San Francisco Chronicle. In 1938 she married Charles Tanenbaum and moved to New York. There she collected Chinese art and developed a deep knowledge of its history. Tanenbaum contributed extensively to cultural and scholarly life. Beyond the essays she wrote for the Christian Science Monitor, she compiled and edited the twelve-part series Chinese Book Arts and California, published in 1989 for the Book Club of California, and created an award for nonfiction writers through the San Francisco Foundation. At Stanford, she endowed the Mary M. Tanenbaum Fund for the acquisition of books and research materials on Chinese art. In 1993, she and Charles received the Warren R. Howell Award for exceptional contributions to Stanford University Libraries.